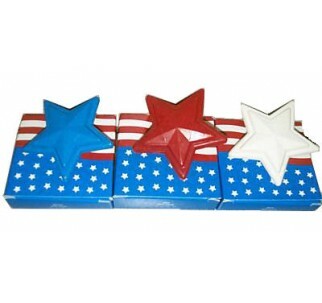 Celebrate the Red, White & Blue with this patriotic set of star-shaped soaps from Avon! These unique soaps make the perfect statement as they compete for attention at your Olympics celebration, election victory party or as an accent for your bath on Flag Day or the 4th of July. Note: Each set includes 3 soaps (1 red, 1 white & 1 blue) - each star is .85oz, 2.5" from tip to tip, individually packed in a colorful box with an image of the American flag and best of all... made in the U.S.A!! !